Written tradition, in the Catholic Church, says she wiped the face of Christ, as He carried His Cross. The wiping of Christ’s face by St. Veronica is also remembered in the Stations of the Cross in the Catholic Church, [i] which is a relatively new tradition that started in the 18th century. However, the written account that follows states that St. Veronica sought out Christ to obtain His image, and that Christ, Himself impressed His image on a cloth she gave Him[ii]. Which is accurate? We do not know. “In written texts, her first appearance is in The Avenging of the Savior [iii], from possibly the 7th or 8th century: She explains to an envoy from Rome that during his ministry Jesus had imprinted His face onto a cloth for her. The envoy takes Veronica and the cloth to Rome, where it cures the Emperor Tiberius of leprosy. What then happened to the cloth is not explained in The Avenging of the Savior nor in the retellings in The Death of Pilate and the Golden Legend. But a cloth with a face purporting to be Christ's was an object of veneration in Rome from at least the beginning of the 8th century, when John VII had an altar constructed for it in St. Peter's. [iv] In the 13th century, Innocent III organized a procession with the cloth and had a hymn written to honor the "Holy Face…impressed on a kerchief whiter than snow and given to Veronica as a sign of love." Where is St. Veronica’s Veil now? Good question! Herein lie some of the complexities surrounding the current existence of the Veil of St. Veronica. There are eye-witness accounts made by pilgrims visiting the Vatican in Rome where the Veil of St. Veronica was kept inside the old St. Peter's Basilica (which was built by the Emperor Constantine) until the year 1600 A.D when construction began on the new basilica. According to one Orthodox article, the cloth known as Veronica's Veil, is still the precious property of the Roman Catholic Church and “…has been placed in a hallowed corner of St. Peter's Basilica in Rome, where it is put on display the second Sunday after Epiphany, four days during Holy Week, Easter Sunday, the Monday after Easter, Monday of Pentecost, February 22, May 3, and November 18 of each year, as well as on other special occasions.” But others disagree with this and say that The Veronica, as the Catholics call the veil, is in the Capuchin Church in Manoppello, Italy. [ii] "The Avenging of the Savior," in Ante-Nicene Fathers, vol. 8. [iii] "The Avenging of the Savior," in Ante-Nicene Fathers, vol. 8. The descent of the Holy Fire at the Church of the Resurrection – or Church of the Holy Sepulcher as it is known – each Holy Saturday is a magnificent and highly venerated event that has been taking place for more than a millennium. Each year, at noon on Holy Saturday, a supernatural light descends on the Tomb of Christ, the Holy Sepulcher, and lights the so-called ever-burning oil lamp in the Tombs interior, while at the same time a blue incandescence from the same light defuses throughout the Church of the Resurrection, illuminating the entire area and spontaneously igniting other lamps and candles around the church. This event has been recorded for at least 12 centuries… this light is identified with the supernatural light that radiated inside the Tomb of Christ during the Resurrection. The Holy Light appeared for the first time during the Resurrection of Jesus Christ, after midnight on Holy Saturday a few hours before the dawn of Easter Sunday, most likely on the day of 5 April AD 33. Holy Fire, The Miracle of Holy Saturday at the Tomb of Christ, written by Haris Skarlakidis. I began my research into the life of St. Veronica when I became Orthodox in 1996 and chose her for my saint. Initially, most of what I found was legend. Then at the request of my spiritual father to write a service for her, my research revealed some remarkable things. 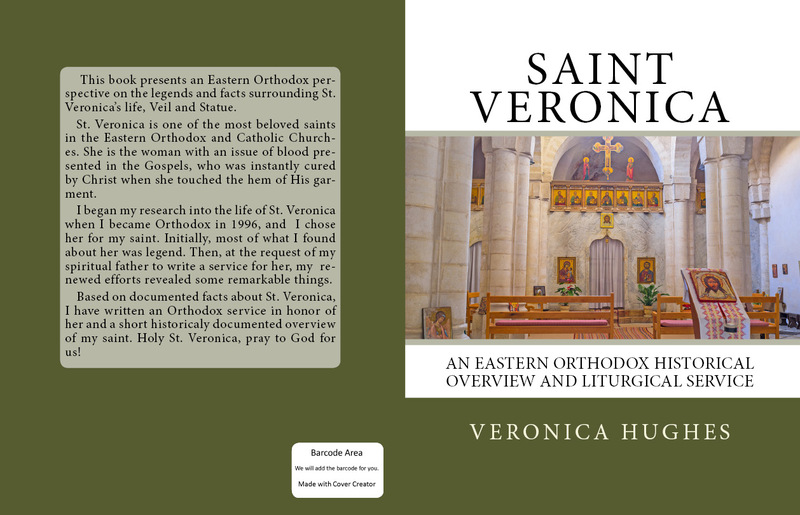 Based on these historically documented truths about St. Veronica, I have written an overview of what is documented about her life, Veronica's Veil and Statue and an Orthodox liturgical service in honor of her. Holy St. Veronica, pray to God for us!